With CTT open events you need to be with an affiliated club but can race in plain kit. For BC you can race as a private member in plain kit, if racing for say LFGSS then need kit. Officially you can be fined by the Comm if riding for a club but in plain kit, rarely happens at local level though. Sorry, just saw this. I picked up some cheap on facebook the same day I posted on here, but thanks. Glad you've got some. Mine will go live on ebay later today. I didn't like them. It was mainly the extensions which weren't long enough to reach my hands. The pads and clamps are ok but a bit fiddly. I got the zipp vuka ones instead which I'm much happier with. Good luck with yours. Thanks. I have a set already, really like the pads and risers, but I swap out the extensions for ones that fit me better. I may have overlooked it but did @xavierdisley do another CTT event spreadsheet for 2019? Can anyone tell me how they managed to route the cable through the middle hole of ventus2 bars? I can get the inner cable through, and I can use that to thread a thin “sleeve” through (the internal tube of some nokon cable outer) but regular cable outer just gets stuck. I’ve tried from both ends and neither works... I think there just isn’t enough space. I know it’s possible because I’ve seen it done (e.g. @umop3pisdn bike) but I just can’t make it work. This is what I’m trying to achieve. I’ve also tried threading nokon segments in from both ends but again they just get stuck. Just brute force, or was there a knack? It feels like the hole is simply too small. What cable outer has the smallest external diameter? Alternatively I’m wondering about threading nokon segments in from both ends and hoping they meet in the middle, but in reality there would probably be a gap resulting in awful braking. Oh yeah you can't get regular outer cable through. I just ran Powercordz inner through the bars and then used outer bits up from the brake to wherever it ended up within the bar. Just did the LVCC 25 on the E1 - windy as hell, but it wasn’t that sketchy with a disk and HED3. Pretty slow though. Any sign of dates for the Richmond Park TTs this year? Has anyone used Tulas with a Tririg brake? Did it work well enough to ensure you're still alive to reply to this message? Heard very mixed things. Depends how much effort you're willing to invest in setup. If it's an Omega X, understand they're much better. 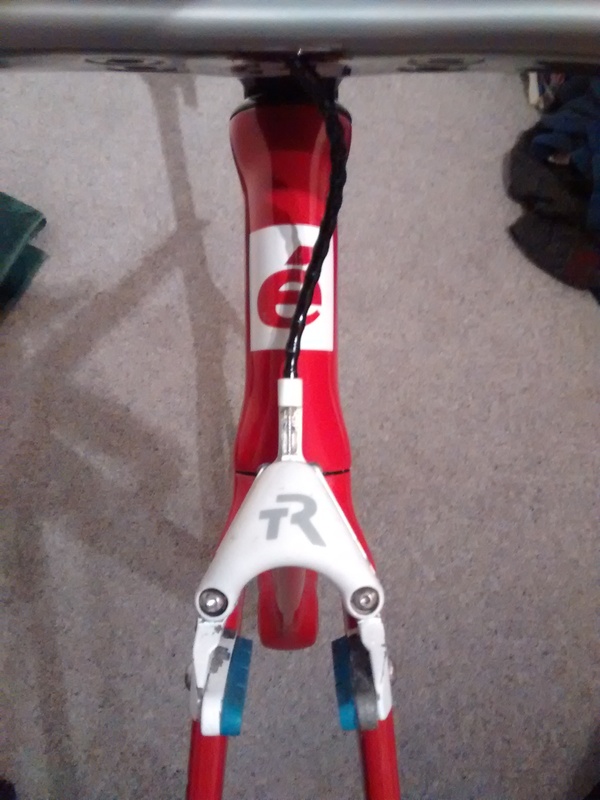 What's the budget option for internally routed Di2 through base and extensions? Junction box inside a stem? Sorry, complete noob to all this but have a 6870 TT kit and looking at starting a long awaited cockpit build. Cheers, gents. The brake in question isn't an Omega X - it's much older and doesn't provide a great deal of stopping power, even with a bog standard TT lever. I'll see how it goes. Good to have a Plan B with Nokon cables if I can't get it working any other way. No, I’ve not really tried but I’m planning to have another look either today or tomorrow. Currently planning on running nokon inner through the length of the bar and then stuffing beads in from both ends in the hope that they push up against both sides of the obstruction. This will leave some of the inner exposed but I’m hoping that the obstruction is small enough not to impact braking. Good luck, i relented at 2:30 am last night and just routed the cable completely outside, it’s unsightly and and i imagine not very aero but my next step is probably enlarging the hole at the bottom of the bars with a drill! Getting your excuses in for not catching Kate?